Artist David Hockney, At 79, Isn't Keen On Parties, But Still Paints Every Day A major retrospective at Tate Britain showcases more than 60 years of Hockney's work. NPR's Susan Stamberg visited the contemporary artist in his studio, high, high up in the Hollywood Hills. 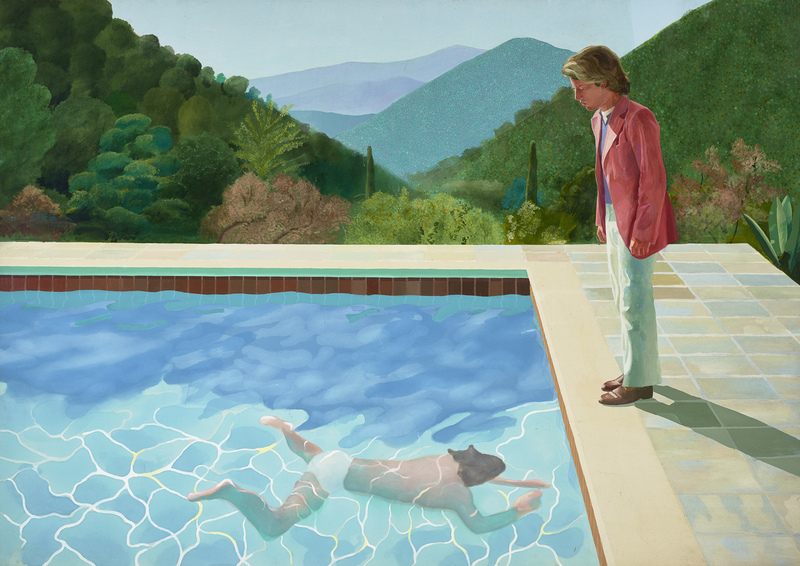 A major retrospective at Tate Britain showcases more than 60 years of Hockney's art. Above, is his 1972 work, Portrait of an Artist (Pool with Two Figures). Painter David Hockney once said, "It is very good advice to believe only what an artist does, rather than what he says about his work." On Thursday in London, a major retrospective at Tate Britain will give visitors the chance to see 60 years of the English artist's "doings." 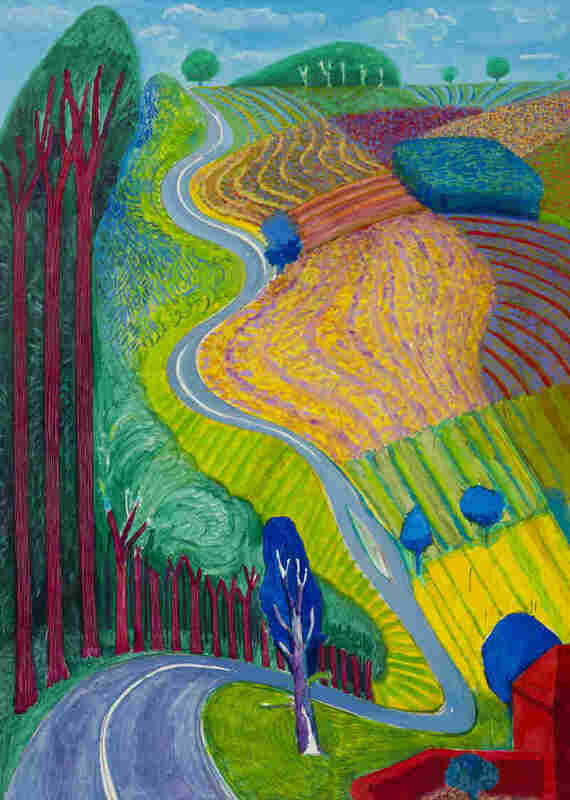 Oils, acrylics, sketches, photographs, smartphone drawings — Hockney has worked in every medium. He's one of the best-known contemporary artists and his works sell for millions. To get to Hockney's studio you go up, up, up a winding canyon road in the Hollywood Hills. It's a neighborhood studded with stars' homes — George Clooney, Kevin Costner and Marlon Brando back in the day. Hockney's studio has five easels, some comfy armchairs and white walls brightened with his works. Never mind the ashtrays — the floor is carpeted with Davidoff cigarettes, chain smoked three-quarters down, then stubbed into dark brown smears. (To make sure it's really out, "I always stub it out with my foot," he says.) There are some splotches of blue paint on the floor — and more on the artist's khaki pants. Hockney stands at a table turning the pages of a brand new Taschen publication called A Bigger Book — a nod to his famous 1967 work, A Bigger Splash. Two feet tall and a foot and a half wide, the $2,500 tome includes reproductions of 450 of his paintings. Inside you'll see LA swimming pools, palm trees, flowers, his dachshunds, the Grand Canyon, portraits of rich and not rich friends, landscapes in the U.S. and Yorkshire, designs for opera sets. He won't linger over any of them and doesn't pause to answer questions. He keeps turning, leafing through a life's worth of works in vivid blues, greens, oranges and fuchsias. 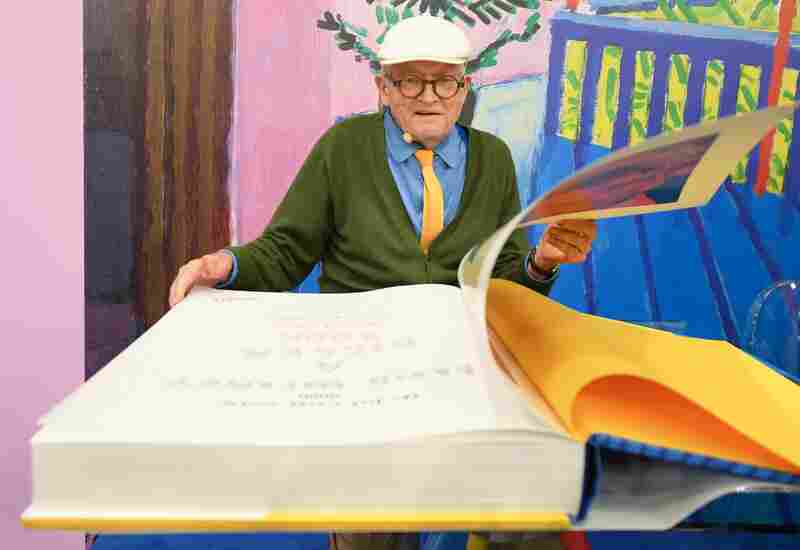 David Hockney looks through A Bigger Book, Taschen's massive collection of more than 60 years of his work. This is art he made from age 16 through his late 70s. He'll be 80 in July and he still paints every day. He probably can't not paint. Wreathed in cigarette smoke, he says the Tate show will be the largest retrospective he has ever had — after all, this one includes 20 more years of work. And as for whether there will be a big party for him in London? "I'm not that keen on parties," he says. "I'm too deaf for them. I can't really go to them. I don't like all the fuss being made. I like doing the pictures — that's what I like. But once they've been done, that's it." He doesn't go out much now. Crowds are too noisy. Losing his hearing has been an isolating experience. "I'm not very good at listening now," he says. When he was younger, he was a lively fixture at parties and friends' gatherings. Not so anymore. "I can't stand it and I just have to leave and go home and sit in a quiet bedroom," he says. "That's what I do. Then I read. ... That's my life now. That's what it's going to be." 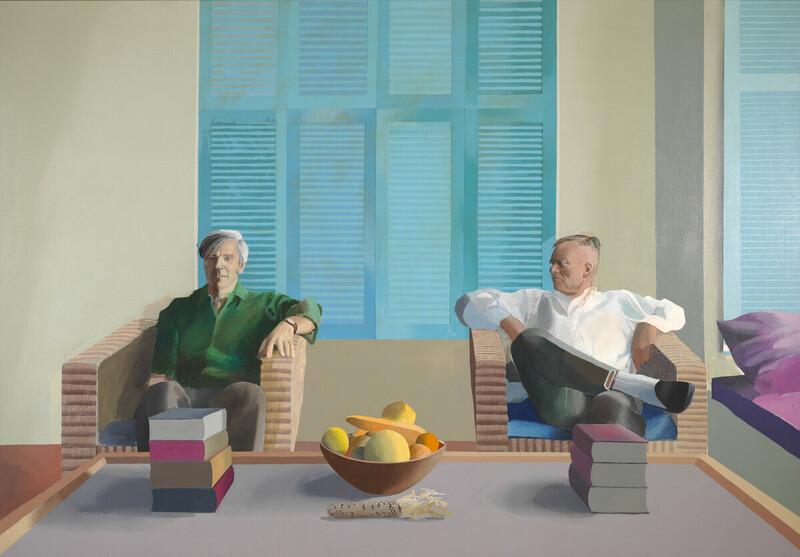 Hockney made this 1968 portrait of author Christopher Isherwood and artist Don Bachardy in their Santa Monica home. This is a portrait of the artist as a not-so-young man — still with a twinkle in his eye, and plenty of joyous pictures left to paint. He still sees the world in the colors of Oz — hues so vibrant and alive that they look back-lit. What creative person doesn't question whether he or she has anything left to say? David Hockney goes into his studio every day and has never-ending conversations on canvas, on paper, in photos, iPads. And art lovers across the world keep listening. 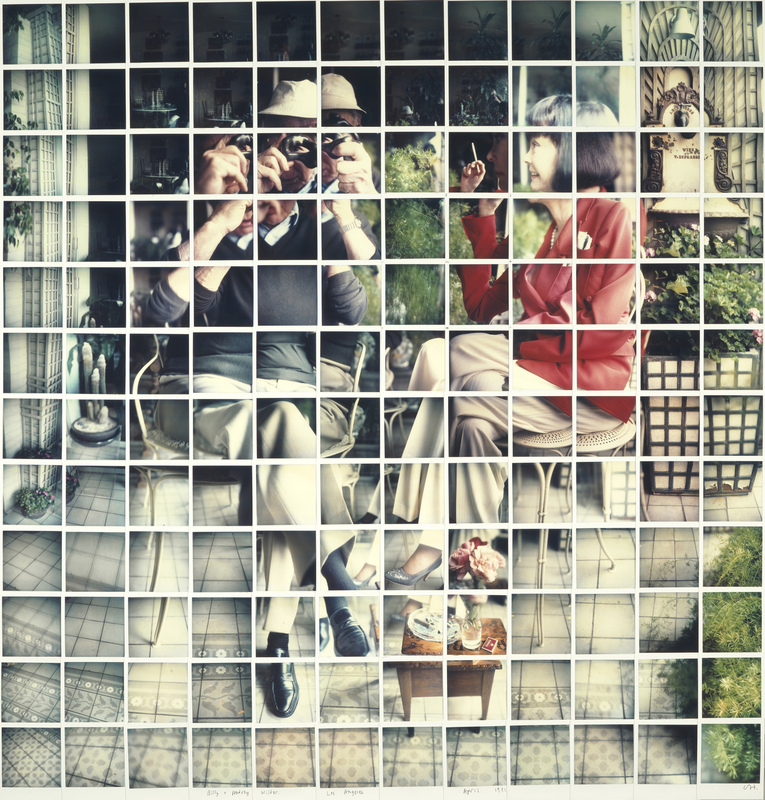 Hockney made this 1982 portrait of Bill and Audrey Wilder out of dozens of Polaroid pictures.